Hello CC fans! Just a really quick post to let you know that I am working on a Circadian Creative Store through CafePress. For now I will update the store with one featured design every 30 days or so. It’s a work in progress and may change over time. 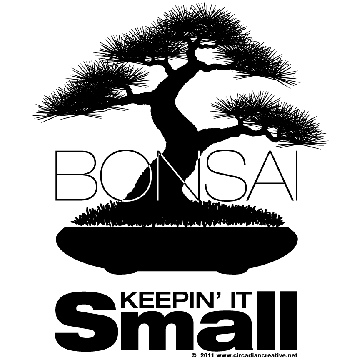 This month’s design is called Bonsai – Keepin’ It Small. If you like Bonsai or know someone who does then you will be interested in having this design on a t-shirt or other keen merchandise.